External Affairs Minister Sushma Swaraj, in the hospital since November 7 after what she shared was kidney failure, is back to responding to people’s SOS and Twitter couldn’t be happier. But she still took time out yesterday to urge a member of the public who needs help to “come see her” in the hospital. 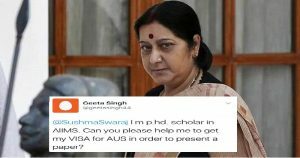 Ms. Swaraj replied to a Twitter user, Ph.D. scholar seeking help having trouble getting a visa for Australia. 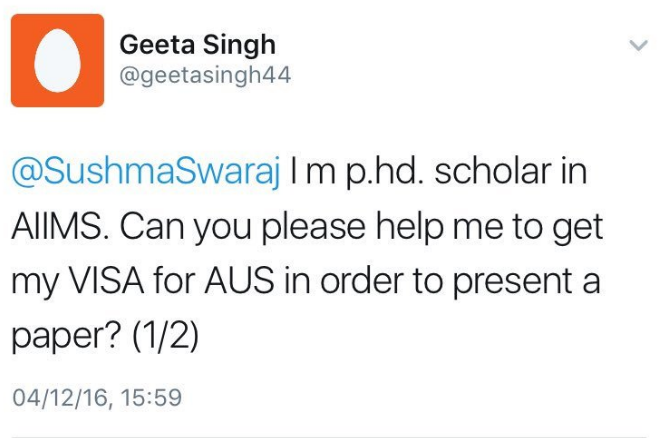 Several people on Twitter criticized Geeta Singh for asking an ailing minister for help with an Australian visa. Still, Swaraj appeared to take no offense. Sushma Ji was admitted in AIIMS to undergo an endocrinological test and everyone was wishing her a speedy recovery. However, the External Affairs Minister didn’t stop working even from the hospital. After seeing this, the ailing minister tweeted: “Geeta – I am also in AIIMS. Pl come and see me here. I will do my best to help you,”. Sushma Swaraj always stands as an inspiration for all. The dedication level of the minister is max.